Echo can allow staff from one school to "subscribe" to the digital library of another school in the New Tech Network. For example, school districts can use this feature to share curriculum between its schools, within the district. Select the desired Course ID and click on Subscribers tab. Indicate whether you're adding a User or Domain subscriber with the dropdown menu. Choose the User or Domain in Subscriber field. Enter a Start Date and an End Date for the subscription (optional). 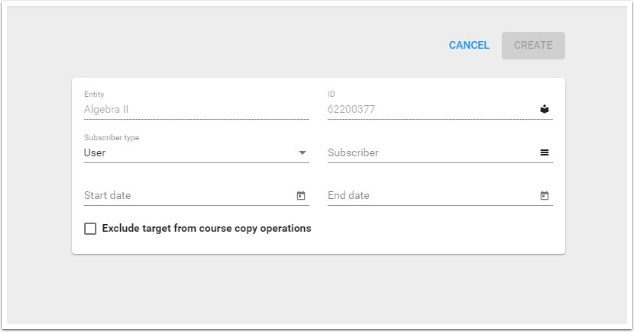 If you don't want the subscriber to be able to copy the target course, check the Exclude target from course copy operations box. If you want teachers and admins in your subdomains to have access to the subscription, check the Give subdomains course access based on this subscription box. Note: This is only available when you select Domain in step 4. To disable a subscriber's subscription, check the subscriber's box and click Remove. Click Edit in a user's column to make subscriber changes.